If I were a more patient photographer with a better camera, and maybe a telescopic lens or two, this would be a picture of birds sitting around in some large viburnums in my back yard. Instead, it's a picture of a little pile of tiny radishes, truly the last harvest this season from my vegetable garden. We should all be planting large shrubs if we have the room for them. They not only can be a "living fence", but they also provide shelter and sometimes food for a variety of birds. Don't be afraid of those big shrubs. Go ahead and plant some in your garden. 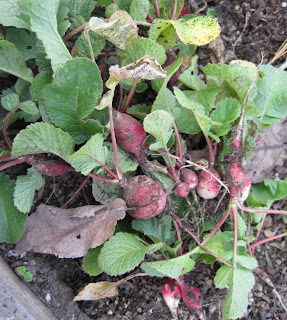 You and the birds will enjoy them for a lot longer than you will enjoy a little pile of fall radishes. ARE there birds in this picture? we know, we know . . .
we're dumber than a bag a hammers. placed to aim they eye, construct privacy and direct paths. And evergreen shrubs provide the best cover for our feathered friends in the winter. I always have a bunch of birds hanging out in the Box hedge. I can't see them, but I hear them chirping away. My favorite shrub is loropetalum, which will grow into a tree form. The birds like the grape arbor, which has climbing roses on the front. Looking forward to Bloom Day. My entire neighbor's house is covered in VA Creeper and is a "living 3 story rowhome". Yes, the birds love it and I enjoy watching them, but my god the noise. Be careful what you wish for.